Prior to every Joyce Chen Foods production run for our Kosher products, a rabbi trained in food production inspects our ingredients to confirm that they meet Kosher standards of wholesomeness and purity. This rabbi also witnesses the boiling of the kettles and cleaning of equipment in preparation for the run. During manufacturing, this rabbi observes the mixing and bottling of the products. Our gluten free soy sauce is manufactured at a facility where we can be certified by Circle K Pareve, which is controlled by the Organized Kashruth Laboratories. The rest of our Kosher products are manufactured at a location where inspections are available from STAR-K, which is controlled by the Orthodox Jewish Council of Baltimore/ Vaad Hakashrus. 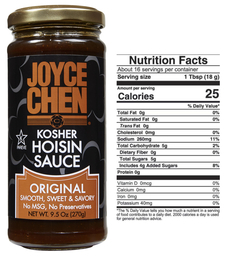 Where Can I Buy Joyce Chen Kosher Products? Our Kosher products are available in a number of locations and maybe purchased online. If you need additional information, please contact us. Add a rich and nutty last minute* finishing touch to your new recipes, favorite dishes, soups, salad dressings, and marinades with Joyce Chen Sesame Oil. Unlike other brands that dilute their products, our expeller pressed sesame oil is 100% pure. Our popular sesame oil is certified Kosher by Star-K.
For a delicious restaurant-style dipping sauce, add a dash of Joyce Chen Sesame Oil to our Joyce Chen Mild or Spicy Dipping Sauce, along with scallions or cilantro. *Due to its low burning point, sesame oil should not be used in deep frying or high temperature cooking. 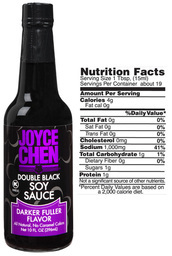 Deepens the flavor of gluten free dishes, from soups and marinades to Asian cuisine with Joyce Chen Gluten Free Soy Sauce. Our high quality, aged Chinese-style soy sauce has less sodium than other brands. Our soy sauce is made by naturally brewing certified organic soybeans in the traditional Asian way. Cheaper soy sauce products on the market tend to be chemically produced, and often contains water, salt, caramel color, and hydrolyzed vegetable protein. This result is a poor tasting, highly salty product. 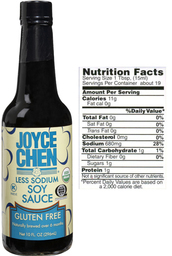 Joyce Chen Soy Sauce does not contain chemicals, artificial colors, preservatives, or added MSG. 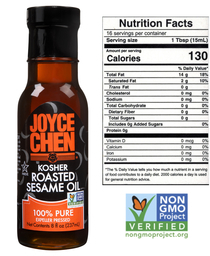 , Joyce Chen Gluten Free Soy Sauce is certified as Kosher by Star K.
One taste and you'll be hooked. Our extra thick and rich all purpose glaze and dipping sauce is make by blending the finest, plump apricots and apples with naturally brewed cider vinegar to create a delicious. Unlike some of our competitors, our duck sauce is not watered down, and does not contain high fructose corn syrup (HFCS). Delightfully piquant, Joyce Chen Duck Sauce may be used as a roasting glaze, or as a great tasting condiment on chicken, egg rolls, fried shrimp, seafood, and a variety of other foods. It has no preservatives, no added MSG, and made with non-GMO soybeans. 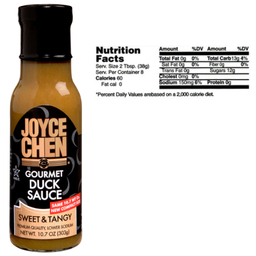 Joyce Chen Duck Sauce is certified Kosher by Star K.
Joyce Chen Hoisin has a velvety-smooth complex fragrant mixture of sweet and savory flavors. Our all-purpose condiment boosts the flavor of marinades, dips, and sauces. Hoisin also makes a great substitute for ketchup or barbeque sauce in meatloaf, ribs, stews and more. Our certified Kosher gluten free Hoisin Sauce is one of the few products of this type offered in the market. Joyce Chen Gluten Free Hoisin opens the door for gluten free recipes that are enhanced by this sauce’s fragrant sweet and savory flavor. 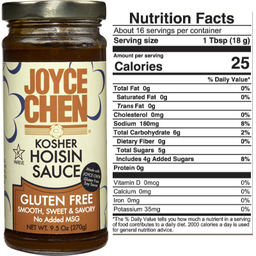 For those with Celiac Disease, or who chose to maintain a gluten free diet, Joyce Chen’s Gluten Free Hoisin fills a space in the market place. It is a unique gluten free product that is also certified Kosher by Star-K, Similar to Joyce Chen’s Hoisin, our gluten free product many be used to boost the flavor of marinades, dips, and sauces, and as a great substitute for ketchup or barbecue sauce. Replace your bland everyday oil and dramatically improve the taste and aroma of any stir fried or grilled vegetables, seafood, or meat. 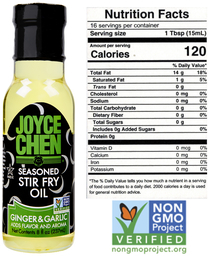 Joyce Chen Ginger/Garlic Seasoned Stir Fry Oil is perfect for conveniently creating delicious Chinese recipes. By infusing essential oils of garlic and ginger into 100% Canola Oil, we create a product that is healthy, well balanced and flavorful, without being over powering. Kosher certified as pure and wholesome, our stir fry oil is trans fat free, and cholesterol free. 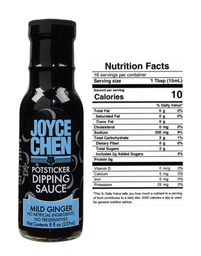 Joyce Chen Mild Potsticker Dipping Sauces contains a unique blend of select ingredients that enhance, not overpower a variety of dishes. Our mild sauce has an aromatic light soy flavor. To achieve a restaurant dipping sauce taste at home, we recommend that you add a dash of Joyce Chen Sesame Oil, and toss in fresh scallions and/or cilantro. 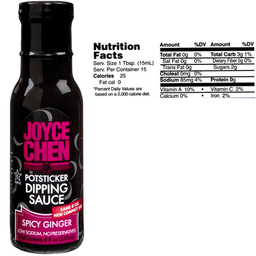 The flavors of Joyce Chen Potsticker Dipping Sauces enhance the flavor of Joyce Chen Potstickers, and as a dip for cold chicken, and other foods. Joyce Chen Spicy Potsticker Dipping Sauce contains a unique blend of select ingredients that enhances a variety of dishes. Our spicy sauce, also known as ginger dipping sauce, adds a kick of peppers.